Staff Nurse jobs and other vacancies are temporary basis for one year only. 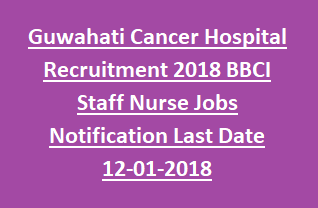 Available vacancies are in BBCI Guwahati Cancer Hospital Recruitment is Staff Nurse, Technician, Lab technician, Anesthesia Technician and other technician jobs. Last date for submission application in a prescribed format for this BBCI Guwahati Cancer Hospital Staff Nurse recruitment is 12-01-2018. Candidates selection for this BBCI Staff Nurse jobs and other posts will be through Merit in qualifications and interview. Interview dates, merit list for interview will be published in Guwahati Cancer Hospital BBCI official website of bbcionline.org. More information about this BBCI Staff Nurse jobs vacancies are given below. There are total 65 vacancies in this Guwahati Cancer Hospital jobs recruitment 2018. For staff nurse posts candidates must have qualified B.Sc Nursing and should have 1 year experience. For Technician Jobs B.Sc with relevant technician certificate is required. Upper age limit for all the posts is 30 years. Reservation will be applicable as per the BBCI selection committee norms. Candidates selection will be held through merit in educational qualifications. Based on educational qualifications marks percentage candidates will be shortlisted for interview. Shortlisted candidates lists for interview will be uploaded in BBCI cancer hospital official website of www.bbcionline.org on 22-01-2018. Interview schedule will be uploaded on 29-01-2018. At the time of interview itself documents verification also conducted. Candidate must have their all original certificates with them at the time of interview. Interested candidates may download the application form from official website of BBCI Cancer hospital @www.bbcionline.org. Filled application form along with all necessary attested copies & marks sheets to be reachable to below given address on or before 12-01-2018.